As I find myself increasingly frustrated with John Tory’s first six months in office, I can’t help but wonder what his motivations are behind his stances on his signature SmartTrack transit plan, the Gardiner East, the Scarborough Subway, and police carding. Despite it’s many flaws, it’s still full steam ahead for SmartTrack; the Scarborough Subway is quickly becoming a fiscal quagmire, and his positions on other issues troubling. A subway alignment along Bellamy Road? That’s madness, not the “bold” transit plans John Tory campaigned on. Is John Tory stubborn? Or getting bad advice? Is he open to contradictory options? Or closed-minded? Is he afraid of admitting mistakes and moving forward? I have been thinking about Tory’s previous runs for office and a bit troubled that his campaign advisers, and even his son*, have become lobbyists representing for some of the most controversial issues at City Hall, such as taxi licencing. One of Tory’s senior strategists, John Duffy, is planning a PR blitz to support SmartTrack. 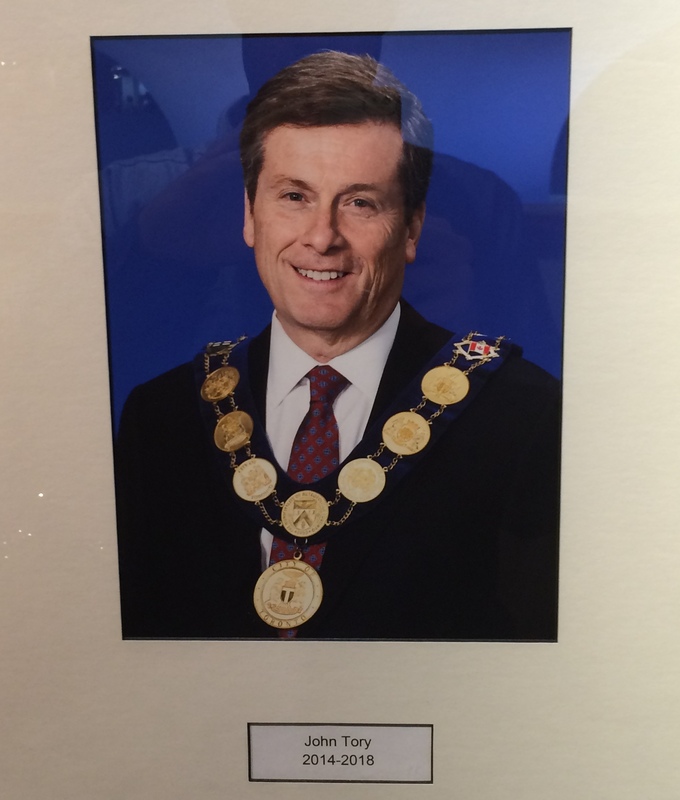 To put it bluntly, I feel that there are serious clncerns about John Tory’s ability to govern. In my opinion, leadership in municipal politics is about making informed decisions, listening to senior staffers, consulting with stakeholders, and coming to sound decisions. With Mayor John Tory, it all appears to be bass-ackwards, with a small group of political advisers and lobbyists calling the shots. I also find myself thinking about Tory’s past leadership. In 2003, John Tory came in a reasonably close second place to David Miller, running on a centre-right platform of responsible governance after Mel Lastman’s turbulent two terms after the creation of the Megacity in 1997. Apart from a website Tory’s team created that attacked Miller for considering tolling the Gardiner Expressway and Don Valley Parkway, Tory’s 2003 campaign was respectable, fair and reasonable, building his name recognition and earning goodwill. Tory seemed like the perfect candidate for leader of the Ontario Progressive Conservatives. The party was looking to shift towards the centre after the Mike Harris/Ernie Eves era., and he had strong name recognition in the vote-rich Greater Toronto Area, where the PCs lost over 20 seats to the newly-elected Liberals in the provincial election that same year. Tory’s PCs ran in the 2007 election on a controversial platform of subsidizing religious private schools. He argued that taxpayers should fund Islamic, Jewish and other faith-based schools, just as the province funded public and Catholic school boards. It became his signature campaign plank, much like how SmartTrack became the most memorable campaign promise of Tory’s 2014 mayoral campaign. Tory’s plan for funding religious schools the wrong answer to a very legitimate question: why, in the twenty-first century, is a progressive, urban, and multicultural province still funding a separate, Catholic school system? In the 1860s, when Catholics were a disadvantaged religious minority in Ontario, and politicians were trying to woo French-Catholic majority Quebec to joining Confederation, it made sense, one of many compromises that made Canada work. But not 140 years later. After all, Quebec got out of its Constitutional obligation to provide Protestant schooling in the 1990s without too much fuss. The religious schools issue was a disaster. Tory mused that creationism could be taught alongside evolution in publicly-funded religious schools; the Liberals jumped on such gaffes. Tory could have made the election about the record of the somewhat unpopular Liberal government led by Dalton McGuinty, but the Liberals saw an advantage and ran with it, winning the election with a second majority government. To make matters worse, Tory, who decided to run in Don Valley West, lost to the Liberal Minister of Education, Kathleen Wynne. After losing a by-election in a rural, supposedly-safe PC seat in order to sit in the Ontario Legislature, Tory quit politics for six years, chairing Civic Action, a non-partisan, business-led urban think tank, an organization whose purpose is a bit mysterious. Tory also hosted an afternoon talk radio show on CFRB. Some of his views as Chair of Civic Action and an easy-going drive-time talk radio host don’t really match what he’s saying today as Mayor of Toronto. Back in 2010-2013, Tory spoke strongly about the need for new funding to pay for new transportation infrastructure, stating that politicians had to be ready to “make the admittedly tough choices about how to raise the money necessary to build a better transportation system.” At the time Civic Action was promoting a public relations campaign, called “What Would You Do For 32?” – the 32 being the number of minutes “saved” if Metrolinx’s “The Big Move” transportation plan – a mix of light rail and bus rapid transit projects, new and extended subways, GO Regional Express Rail, and some highway expansion projects in fringe urban areas. Civic Action declared the campaign to be about pressing for “bold leadership” to “dramatically improve transportation in the Greater Toronto and Hamilton Area (GTHA)” [There’s that b-word again, which would be used again and again to describe SmartTrack in Tory’s campaign speeches.] As I read it, Civic Action’s role would be mostly limited to public relations work to educate and promote new revenue tools (taxes, fees and tolls) to businesses and the public in order to fund these projects. In January 2013, Tory was quite vocal about the need for investment in the high-level plan that Metrolinx put together, itself largely guided by the list of wants and needs brought forward by local municipalities. Interestingly, the Big Move identified the Scarborough and Sheppard LRTs to be built as part of the 15-year plan, while a “Relief Line” – a 13-kilometre subway corridor, was part of its 25-year plan. This was the plan that Civic Action, and Tory himself, were promoting. There’s a reason why SmartTrack never appeared on Metrolinx’ maps: it was interested in transforming the GO Transit commuter rail network into a regional express rail system, starting with the electrification of the Georgetown/UP Express and Lakeshore corridors, as well as the municipal rapid transit plans proposed or approved at the time. Eglinton Avenue west of Mount Dennis was to be served by an extension of the Eglinton-Crosstown LRT; it would meet the Mississauga Transitway at Renforth Drive. The combination of improvements to the Yonge subway line, the upgrades to GO’s rail network, and the eventual construction of the Downtown Relief Line subway didn’t leave any need for SmartTrack, which would have duplicated these other lines. But in May 2015, Tory is so committed to SmartTrack, he is now looking at even more expensive options for the Scarborough expansion of the Bloor-Danforth subway, as the two projects run in close parallel to each other through central Scarborough. This could increase the already expensive $3.56 billion subway extension’s cost by an extra $1 billion. On the Gardiner East, we hear John Tory call the “hybrid” solution – essentially a replacement of the existing expressway on a slightly different alignment “the right, balanced decision that made common sense,” in an interview with TVO’s Steve Paikin. But senior city staff like Chief City Planner Jenniffer Keesmaat and Medical Officer of Health David McKeown, and other experts such as former Chief City Planner Paul Bedford all call for the removal option, in which Lake Shore Boulevard is upgraded to handle the additional traffic. This statistic comes from the University of Toronto traffic study, which was commissioned by the Gardiner Coalition, which includes the Canadian Automobile Association, courier companies, and other industries. Eric Miller was one of the co-authors of that study. Even Tory’s hand-picked transportation expert wondered if the Scarborough subway extension is such as good idea, but Tory, for some reason, remains entirely committed to it. Back in 2007, I don’t think that Tory himself even believed in the idea of funding private religious schools all that much; I have the feeling (and I’m not the only one) that he didn’t really believe in the idea himself, but allowed his advisers and confidants to push for this ill-advised platform. At Civic Action, Tory sounded rather progressive, as he surrounded himself with civic boosters, urban planners, and activists. On SmartTrack, like so many important and controversial issues, it sounds like Tory listened to a select group of campaign and policy advisers, and quickly closed his mind to any other ideas or criticism. On police carding, which is grossly racist and ineffective, Tory has also dismissed criticism and has done nothing to address this matter. Tory helped to select Mark Saunders as Toronto Police Chief, who unlike his rival, fellow Deputy Chief Peter Sloly, supported the practice, even going as far calling those persons innocent, yet carded anyway “collateral damage.” On Uber, Tory has been supportive of a full council debate, putting off much-needed taxi reforms until the courts can rule on the city’s previously-filed injunction against the controversial company’s Toronto operations. Tory ran for mayor with zero experience in municipal politics; he has been used to life on Bay Street, a chummy business environment. Perhaps that’s where Tory’s leadership style comes from, and maybe he’ll learn on the job. But with a small group of political advisers and lobbyists influencing the mayor, he is deprived of wider opinions and facts that I think are necessary for better decision-making. As long as he has the support of enough councillors, he’ll be successful implementing his so-far fiscally irresponsible agenda. But in his first year Rob Ford had the support of council on most important votes; what happens when the honeymoon is over? This entry was posted in Politics, Toronto and tagged John Tory. Bookmark the permalink.